Spectrum/Big Y in New Milford presented Faith Preparatory School in town with a check for $5,000. The school was selected to receive the funds through Big Y’s Education Express Program. Above, students receive the donation at a recent check presentation. Shown are, from left to right, in front, Ruby Ebanks, Samuel Dumas, Rylan Bonavist, Ryden Parker, Lucas Gibbard and Faith Dumas; second row, Tricia Reitz, Gabrielle Bonavist, Victoria Kravarik-Reed, Luke Bonavist, Damon Parker and Moriah Mattison; third row, Ava Staiti, Morgan Gibbard, Luke Stuerken, Malachi Dumas, Madeline Moore, Liana Mattison, Elissa Gomez, Candace Mattison and Jesse Walker and, in back, Big Y Store Director Brian Murtha, Faith Preparatory School Principal/Administrator Jaclyn Mattison, Big Y employee services representative Regina Torsiello, Alex Reitz, Joshua Mattison, Nathan Bonavist and Trey Parker. Faith Preparatory School in New Milford is raising funds to build a playground. Big Y in New Milford recently contributed money to help the K-12 school achieve its $50,000 goal. 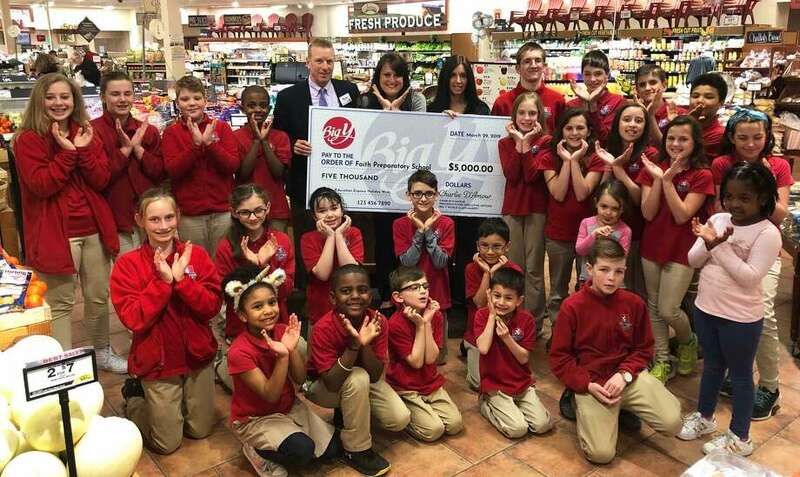 Representatives from the school visited Big Y April 9, where Store Director Brian Murtha and Regina Torsiello, employee services representative, presented students and Principal/Administrator Jaclyn Mattison with a check for $5,000. The school was selected to receive the funds through the store’s Education Express Program. As part of the Education Express Program, schools were invited to submit a holiday wish for their school. Faith Prep wished for a new playground. The school is in the process of collecting bids for the playground equipment and has located an organization, Where the Angels Play, to install the playground at no cost. After installation, Where the Angels Play will use the school’s site at 600 Danbury Road to commemorate the victims and their families affected by the 2012 shooting in Sandy Hook with a brick walkway. The school has raised approximately $10,000, including funds from Big Y, for the project thus far. Mattison said the proceeds of this year’s trip to see the Yankees vs Red Sox May 31 at 7 p.m. will be used toward the project. Tickets to the game are $62 each. The school will receive $30 for each ticket sold. In addition, the school is opening up the baseball fundraiser to other organizations. Faith Prep will provide tickets for the game to interested organizations that would like to sell tickets to their communities, with the school providing $15 to the organization for each ticket sold. A total number of tickets sold must be reported back to the school by April 30. Each participating organization will then submit a check to Faith Prep School for the total amount of ticket sales, less $15 per ticket. Tickets for the game can be purchased at www.event-18466-30e9.pushpayevents.com, where funds will benefit the school. Donations for the school project can also be made through the link. For more information, call the school at 860-210-3677.